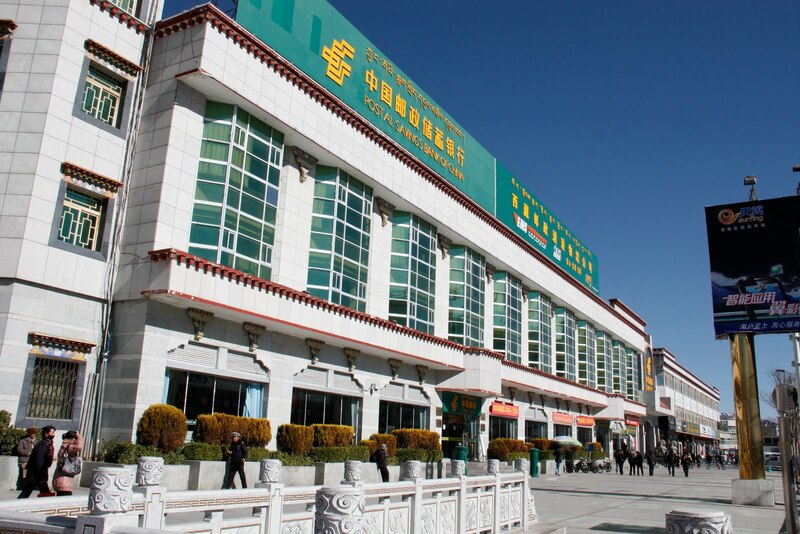 Main Post Office at Lhasa, beside Potala Palace. (TibetanReview.net, Aug14, 2015) – As a part of stringent new security measures for the 50th anniversary of the founding of the so-called autonomous region of Tibet, China’s State Post Bureau (SPB) has made it mandatory to provide real names of both the receiver and sender for sending mails to the region, reported China’s official globaltimes.cn Aug 12. The purpose, it said, was that the authorities needed to step up checks for illegal packages, especially banned political publications, besides guns, flammable materials and explosives, illegal knives, and hazardous chemicals. The report also said postal companies needed to closely monitor newsstands to prevent illegal political publications from being sold. The order, issued in the form of a circular by the SPB on Aug 12, will remain in force from Aug 20 and Sep 12. China will celebrate the establishment of the Tibet Autonomous Region on Sep 1. It was cited as stressing people needed to provide legal identification to both send and receive packages and also allow their parcels to be inspected. Notices were also reported to have been sent by the SPB to local postal authorities and express delivery companies, requiring them to ensure the security of courier services during the celebrations. The report said a series of celebrations will be held from August to mid-September to mark the 70th anniversary of victory in World War II and the War of Resistance against Japanese Aggression (1937-45), while events to celebrate the 50th anniversary of the establishment of the Tibet Autonomous Region will be held in Tibet in early September. However, Tibet as an independent country had adopted and strictly adhered to a position of neutrality during WWII while the Sino-Japanese war had nothing to do with it.